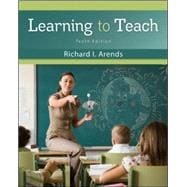 This best-selling text provides comprehensive coverage of general teaching methods and models. The most balanced text in its field, Learning to Teach strikes a harmony by integrating researched-based practices with practical consideration and opportunity for real-world application. The text provides strong coverage of both teacher-centered and student-centered models. By covering all major teaching models plus the leadership of teaching, including planning, classroom management, assessment, motivation, and management of time and space, Learning to Teach helps future teachers master both the theory and application of successful teaching.